My internship at The Huffington Post has winded down to an end. I’m sad to leave though I have an intense feeling that I’ll be back after graduation. The experience I’ve had during the past ten weeks has been absolutely invaluable. I’m an adventurer but at the same time I’m always scared of trying new things. I wanted to pass along some advice that I’ve taken away first hand from submerging myself in an entirely new environment. 1) Have self-efficacy and be confident. I came into this internship so fearful I was basically paralyzed. I’m not a journalist. I’m not a reporter. What the heck are they going to want from me and what in the world am I going to contribute? After putting myself way down, I finally picked myself up. I am a creative writer who is enthusiastic to learn. With the right attitude about my capabilities I was able to confidently and efficiently take on new tasks. I was also more confident enough to pitch ideas and contribute my perspective to rising projects. 2) Introduce yourself to everyone. Not just your fellow newbies or the people on your team. I mean everyone. I met Arianna Huffington, Tim Armstrong (CEO of AOL) and made connections with a variety of other employees in different verticals. Not only was I able to create a substantial network at HuffPo but also I was able to demonstrate that I want to be a very integral part of the community and not just another summer intern. 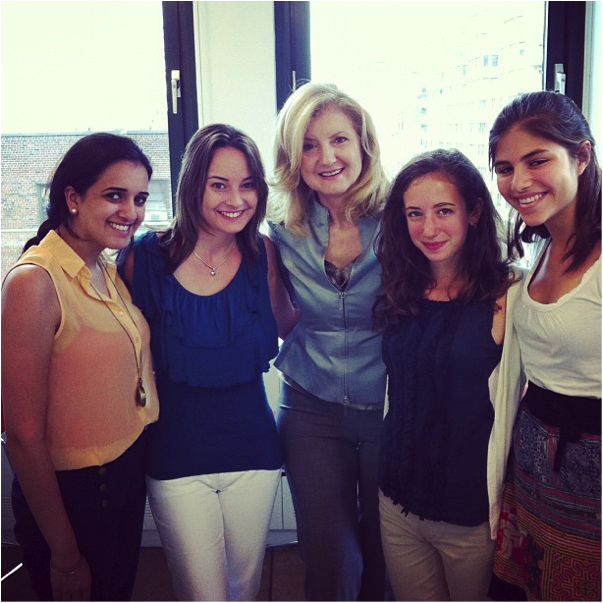 Arianna Huffington (in the middle) and some fellow interns (me on the left). 3) It’s okay to be afraid. It’s completely natural to fear inadequacy and incompetence when you are diving headfirst in to something you’ve never experienced before. The key, as all the clichés say, is to not let the fear stop you from making the most of the experience. I hesitated a few times in pitching ideas or respectfully voicing opinions. When I finally got the courage to speak up, I was more respected and appreciated by my team. I realized that the fear will be there but it’s overcoming it that opens new doors. I wasn’t the run of the mill, average journalist intern that HuffPo has seen. However, I believe wholeheartedly that that’s exactly what made my experience much more rewarding. I was able to learn the everyday skills as well as contribute ideas from a unique perspective. It was a give and take and I hope that HuffPost took half as much from me as I did from the experience with them. I’m anxious to see what’s next for me but I wouldn’t be surprised if coming back to HuffPost was part of the plan. Regardless, all of these points I mentioned are lessons I’m going to take with me wherever I go in life and I hope that they can also help ease your next transition into something new. Remember: being new is fine but being isolated because you’re new is not.